Today is the day! 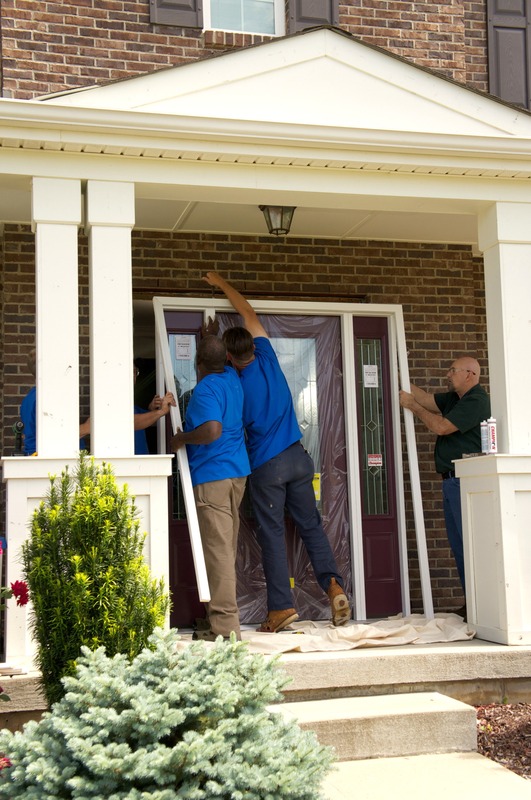 I am very excited to take you through the installation process and reveal of our new front door from Champion Home Exteriors! We’ve had our new door for about a month now, and we are so happy with it. 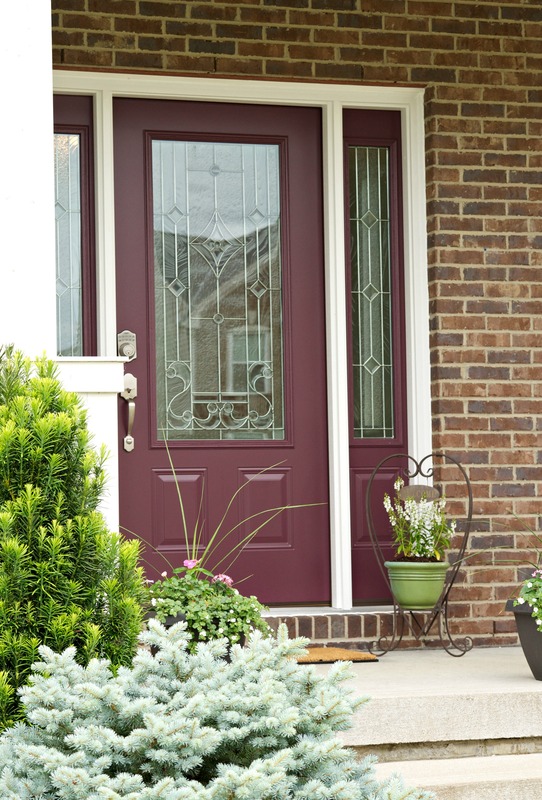 The beautiful glass design and pop of color make it a statement piece on our home, and really up our curb appeal. 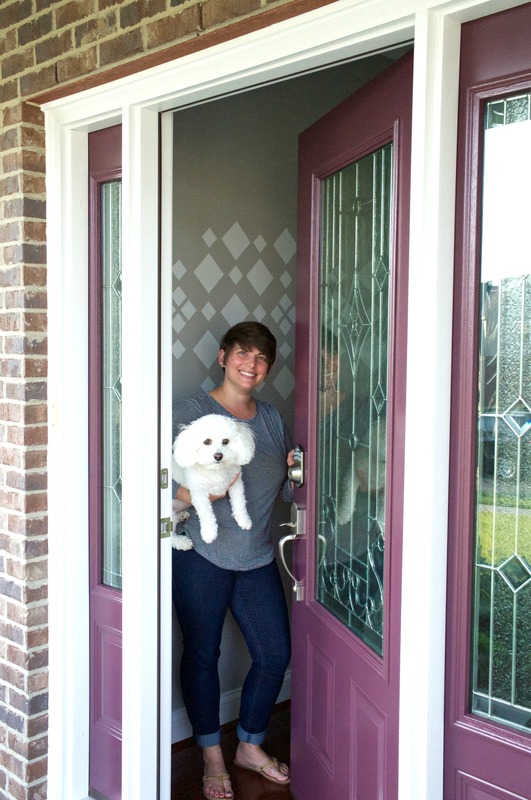 I’ve already talked a bit about why we decided to upgrade our door and shared more about our design selection process here and here. So let’s jump right into the before, during and after! While our old front door was functioning just fine, it was a bit blah (and a lot of brown) and we were ready for a fresh change. 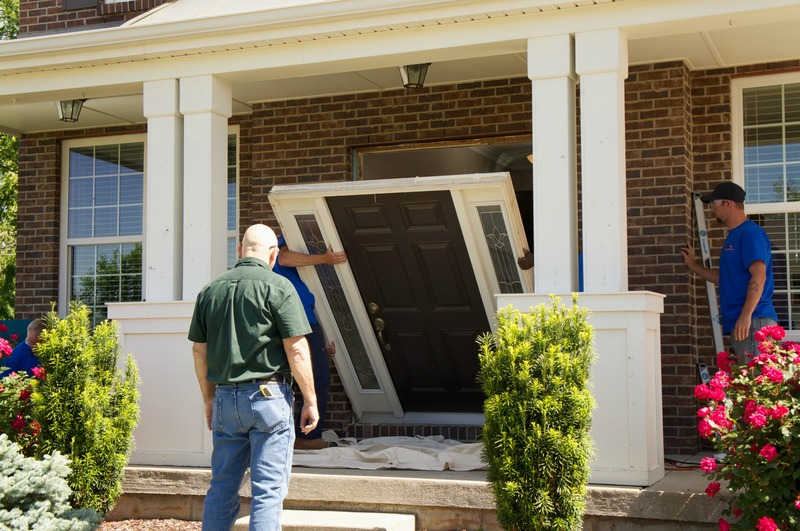 I’ve never had a front door replaced, so I wasn’t sure what the process of removing our old door and installing our new one would be like. 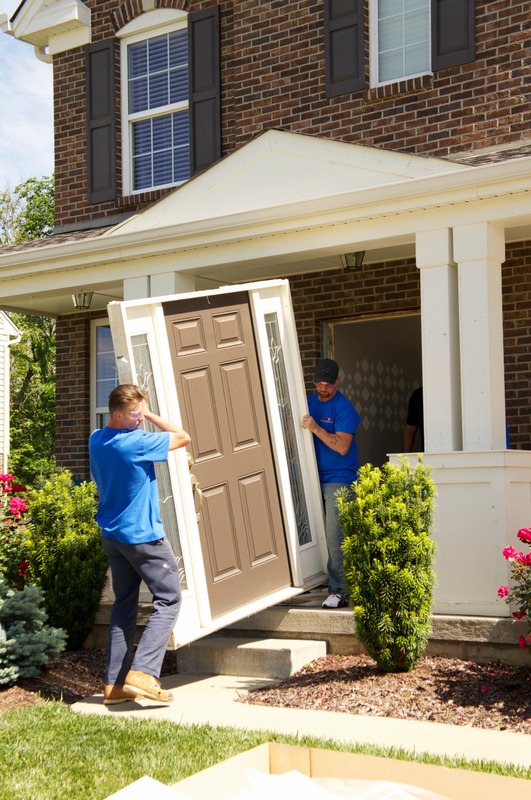 It took the crew from Champion several hours to swap the doors, but overall, it was a pretty straightforward and simple installation. 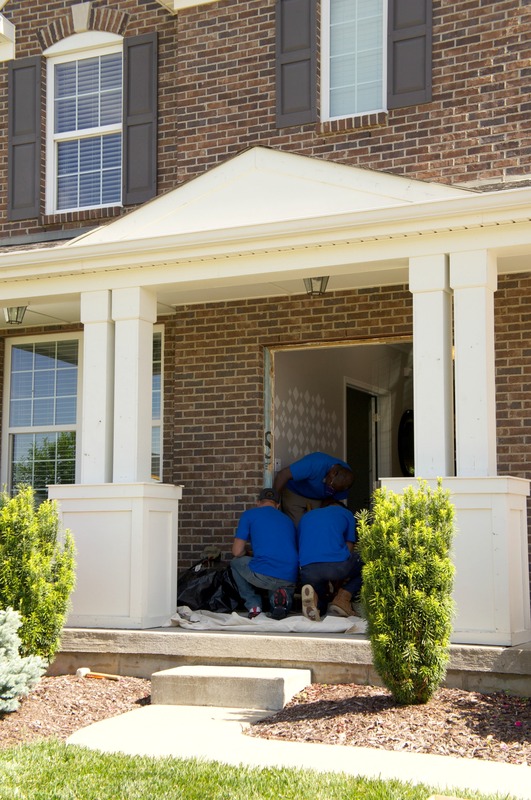 Work began by carefully removing some trim and loosening the frame around our old door. The trim pieces needed to go back on, so these were set aside. 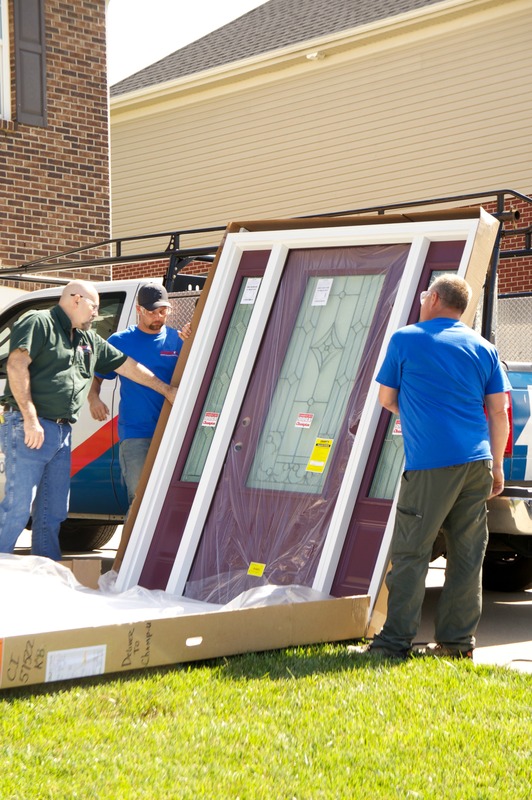 Once the door was free from the frame, the installation team carried it out to their truck to haul away. It was a little strange to see a gaping hole in the front of our house, but it wasn’t this way for long! 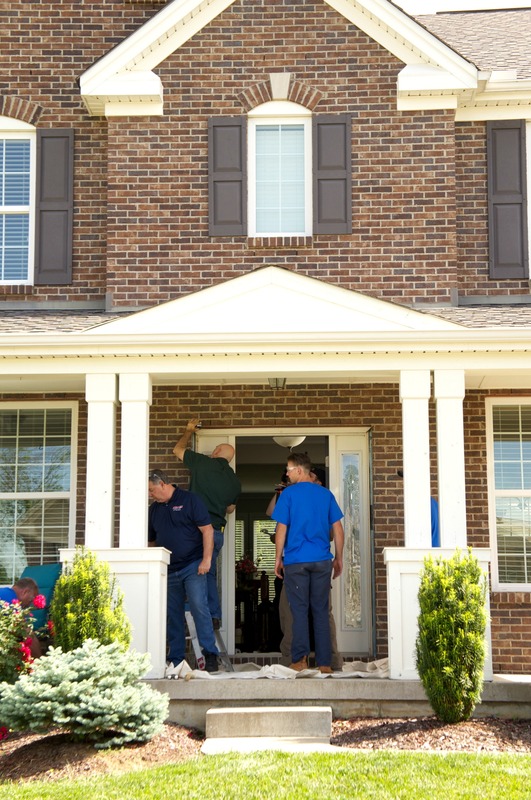 The new door was unwrapped, carried up our walkway and set into place. 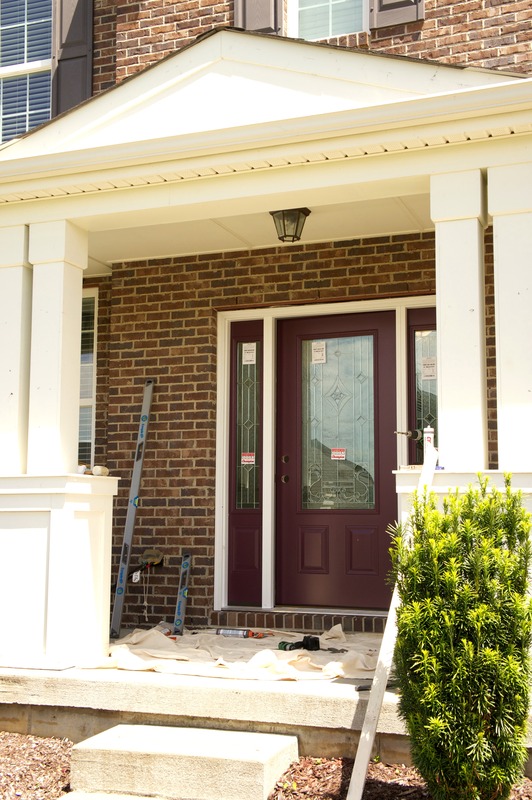 At this point, you’re probably saying wait—is that a purple door? Why yes, yes it is! I fell in love with Champion’s “Plum Silk” paint option and had to have it! 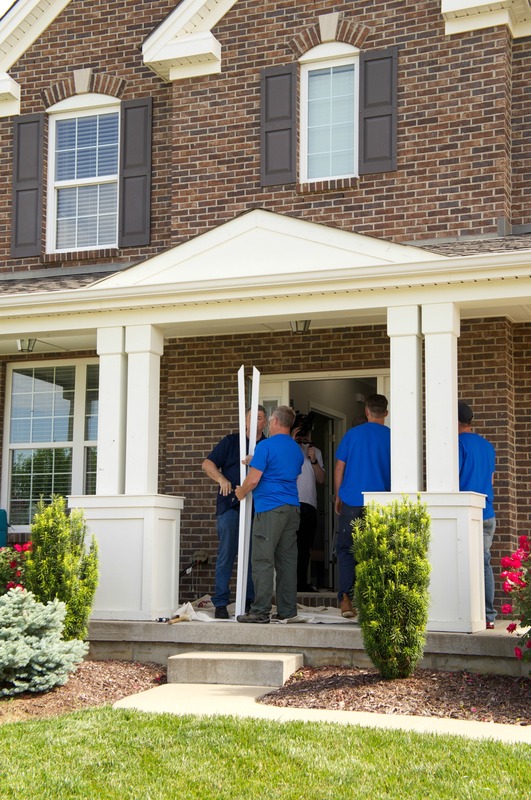 With the door in place, the installation team worked their magic to make sure the fit was perfectly snug and properly in place. They secured the door, re-attached the trim pieces and assembled our new lock and handle. The last details of the installation were touching up any scuffed paint and cleaning up any marks. The team was very careful to protect the hardwood floors in our entry, which I really appreciated. A few hours later, we had a beautiful new door! 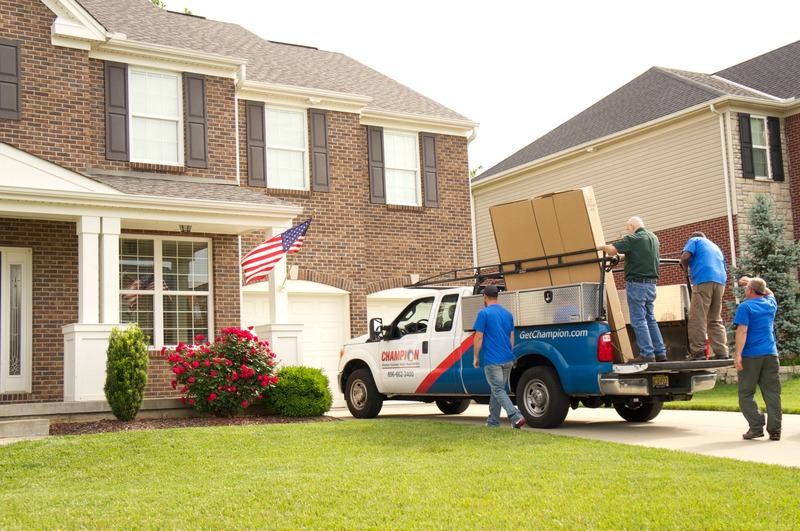 It adds the perfect pop of color and style that our home needed, and really sets our home apart. 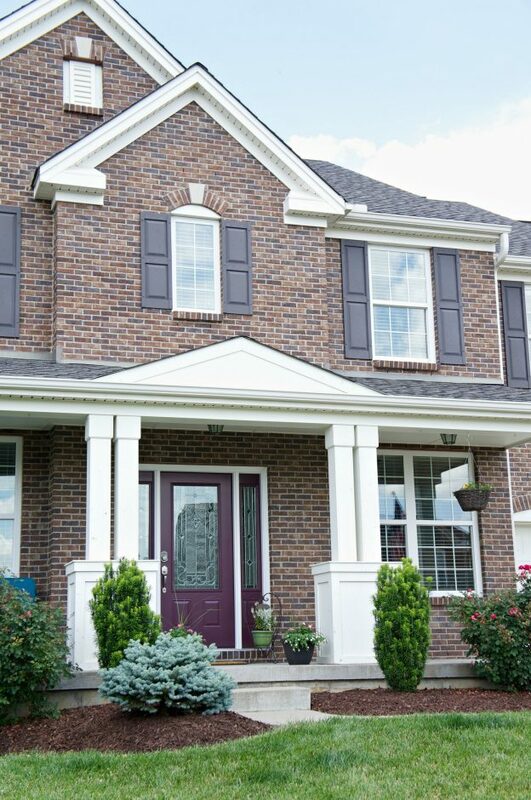 The “Plum Silk” paint is a deep yet bright purple, and it complements our brown brick and shutters very well. We really love how the glass design we chose looks in person. We picked the “Eclectic” design and coordinating sidelights. This design lets so much more light into our foyer, which is a nice bonus, but we don’t feel like we’re compromising on privacy, either. Another feature we really like is the lock. 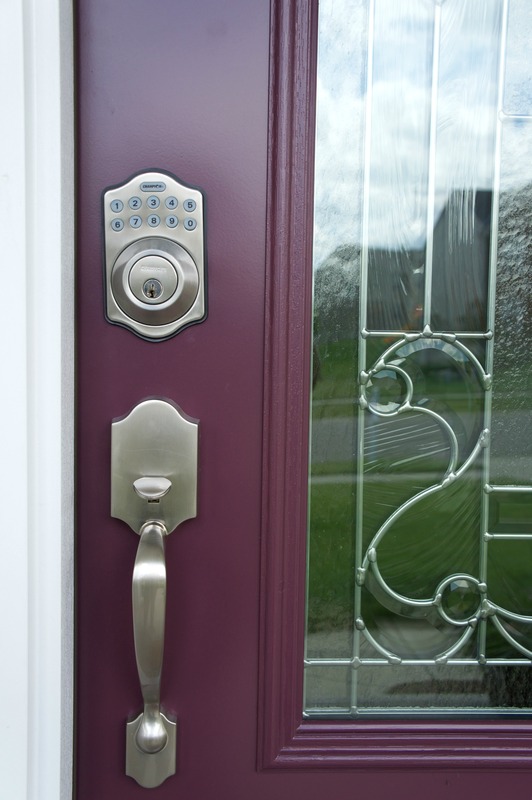 My husband and I opted to go the tech route with an electronic deadbolt. How it works is there’s a keypad on the deadbolt system. The door can be locked from the outside by simply pressing the “Champion” button. Then you set up a unique code that is used to unlock the deadbolt. I love the convenience of the electronic deadbolt. 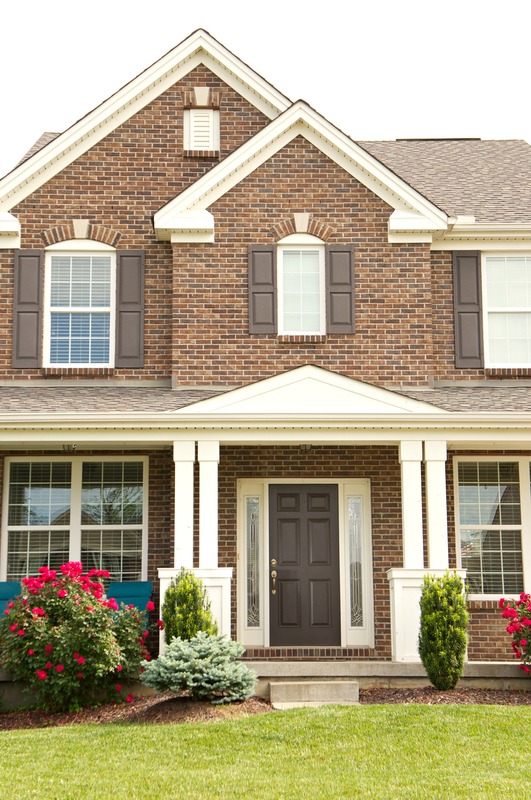 It’s nice not to have to remember a key when we take our dog for a walk, but we can still be sure our home is secure if we’re not in the immediate area. I think this will be a great feature once we have kids, too. 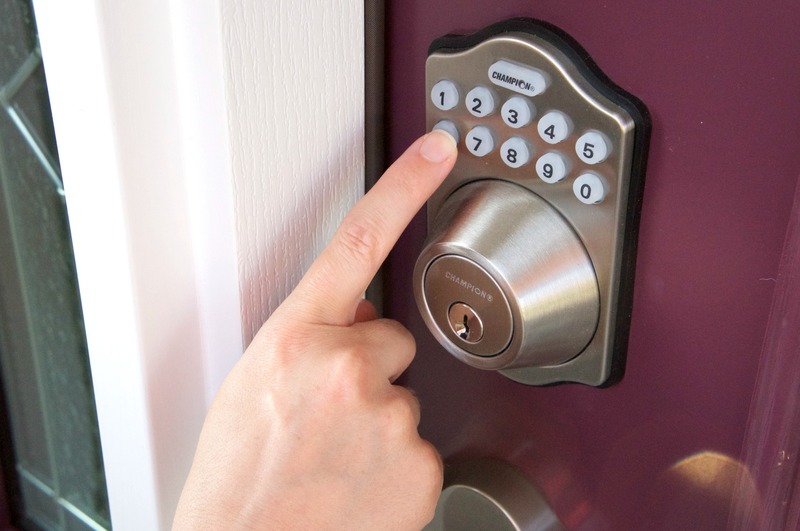 They can let themselves in and out without worry of misplacing a key. Overall, we are so pleased with our new front door, and I feel like it really completes our home’s facade. 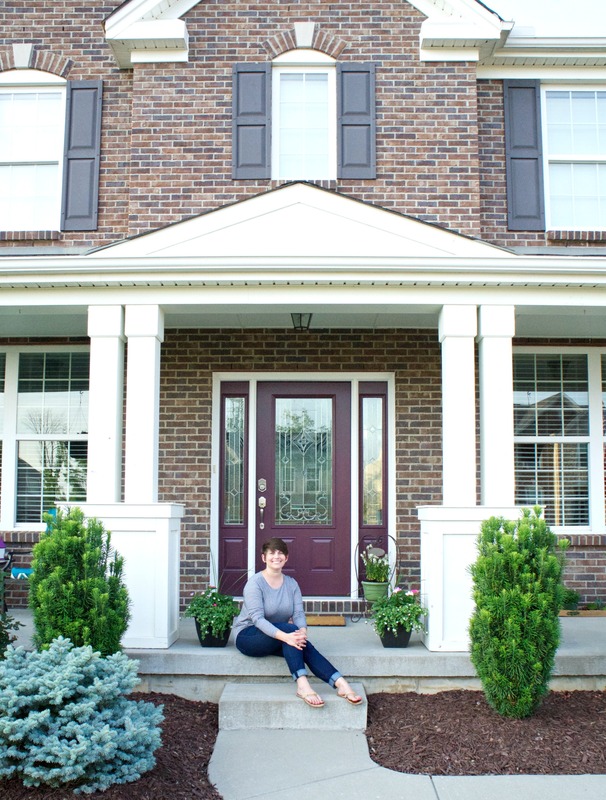 I love pulling into our driveway and seeing the difference it makes to our house and our curb appeal! 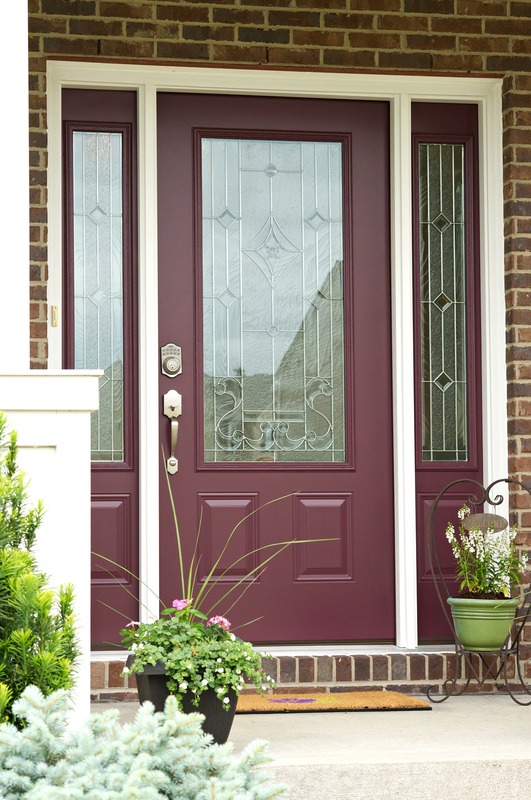 If you’ve been considering an upgrade to your front door, head over to sure to Champion Home Exteriors and check out their impressive selection of door options and hand-assembled glass inserts! This entry was posted in Around the House on June 29, 2017 by Two Purple Couches. The door looks great!! I love that it lets in so much light – and that keypad is so convenient! It looks so fantastic! I love the color you chose, and the glass is beautiful too. I’m definitely going to check out their website – I’m desperately in need of a new front door! 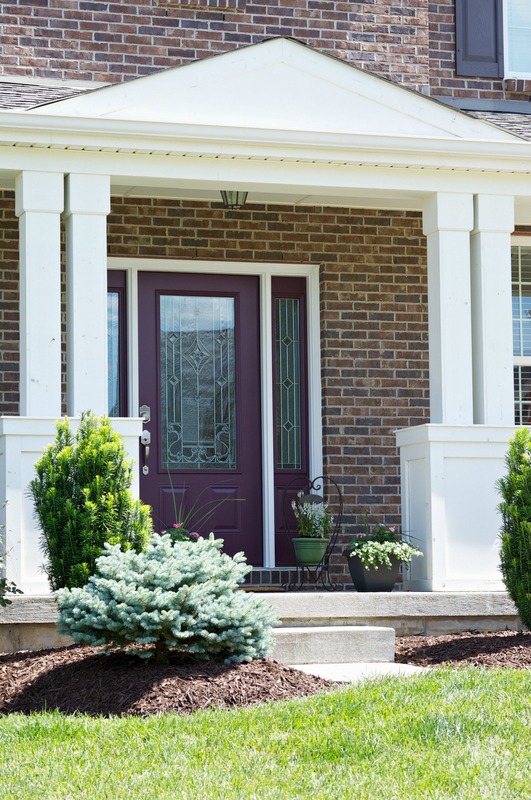 This door made such a huge difference in the curb appeal. I LOVE the color! Thanks Roxanne – we can’t believe what a difference it’s made! We love your new door! 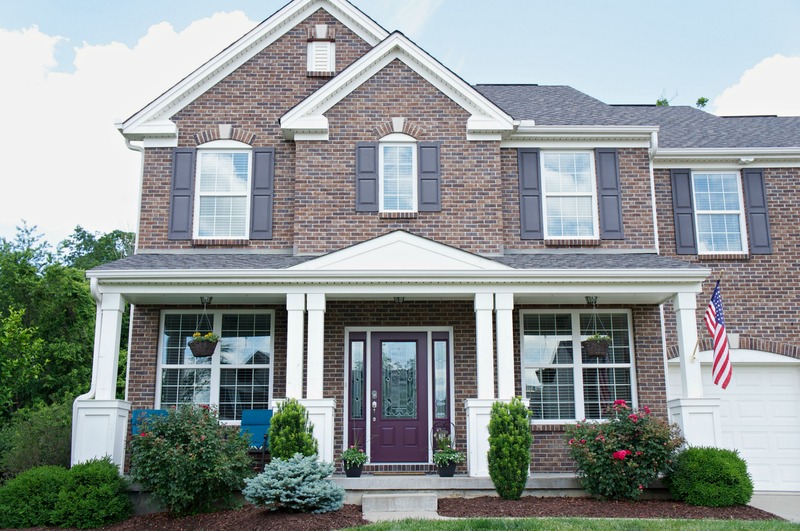 It looks great and adds a lot to the curb appeal of your home. Well done Champion!!! Thank you Tom! We are so happy with how it turned out! It looks amazing! I love the new color and design! 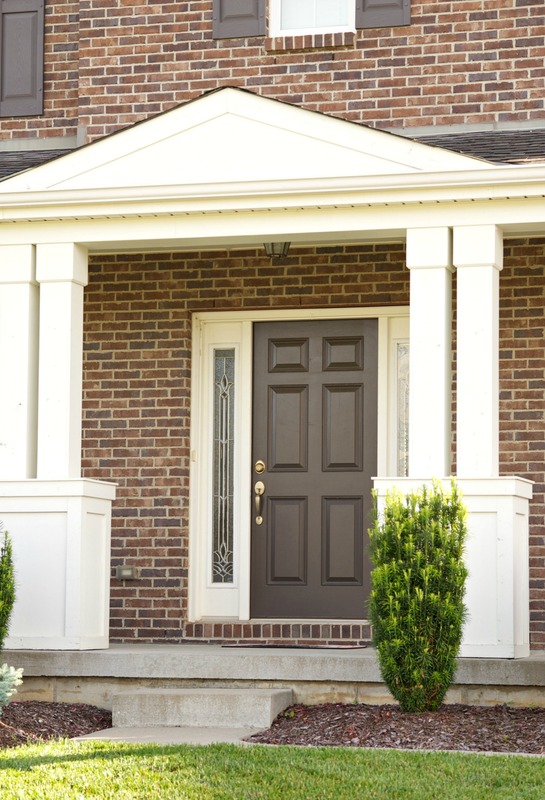 Your front door is stunning! Laura / Pet Scribbles recently posted…How to make a Beautiful Summer Wreath from a Christmas Wreath! I love your new door! What a big difference! Fabulous door. The color is so beautiful and matches the bricks on the house perfectly. Nice!